A pair of good quality and stylish kids bike gloves is an essential accessory when you are buying some extras for your balance bike! Kids bike gloves perform several functions, as they will not only help to protect the hands in the event of a fall or scrape against walls, trees or other such hazards, they can also help to provide extra grip on the handlebars as well as keeping the hands warm. 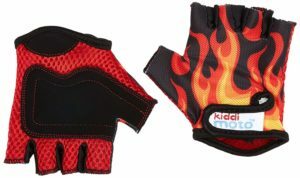 Kiddimoto offer a fantastic range of really good looking kids bike gloves, available in a number of different styles which complement their range of funky balance bikes. The gloves feature padded palms for extra protection, Velcro straps to keep them secure on tiny hands and a fingerless style which allows the rider greater dexterity. These are possibly the best kids bike gloves available for younger balance bike riders, as they are suitable for children from the age of 2. There are two different sizes available with the smaller size suitable for the younger age group. This is in contrast to many of the bike gloves available from other bike manufacturers, which are mainly catering for older children with the smaller sizes fitting children from age 4 or 5. Kiddimto Bike Gloves are great value and are usually available for less than £10! As mentioned above, the smaller sizes of many bike manufacturers are suitable for children in the higher end of the balance bike range. 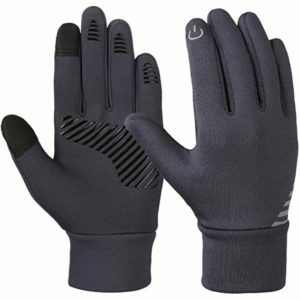 These gloves from Vbiger are an excellent choice, as they are made from soft lycra with a smooth fleece lining to keep the hands warm. They also have an anti-slip silicone printing on the palm and fingertips to provide extra grip. These kids bike gloves are lightweight so they provide great freedom of movement, and they also have a touchscreen function on the thumb and index finger so they can be used with smartphones and tablets! It is useful to know that these gloves are not very thick, so although they are ideal for the cooler autumn months they will not provide full protection in the depths of winter. However, they are a really good choice for 4-6 year olds and are available for around £8.99. Several balance bikes have a BMX, sporty or motorbike style, and if you are looking for some bike gloves to match then these gloves from Leopard are ideal! They are available in a range of bright colours including red, blue, black, yellow and green – and they are made from a breathable mesh construction with reinforced thumb and palm. The Velcro strap provides a secure fit, and they offer great protection against falls and scrapes. The small size of the Leopard Motocross bike gloves are suitable for 4-6 year olds, and they are generally available for just under £10. 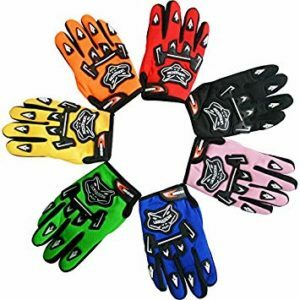 This is a just a small selection of the kids bike gloves available, as there are also excellent gloves produced by companies such as Polaris and Wulfsport. Most gloves are available for between £5 and £15, so it is a just a small investment to enjoy all of the benefits that kids bike gloves provide.